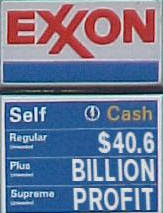 It really shouldn't be much of a surprise but Exxon Mobil reported a record $40.6 billion profit for the year. This was a 3% increase from last year's record profit. The company's sales, $404 billion, was more than the Gross Domestic Product (GDP) of 120 countries. Another record year. And of course, a record year of high gasoline prices at the pumps for million of American motorists too. Now more than ever, more Americans are clearly seeing the need to develop, promote and use alternative forms of energy. Q: What's Black and White and Green All Over? Poll: Who Will Do the Most? OPEC to World: No More Oil for You!